Coming off of a scalding loss, the whole party—and not just the insiders at the top—needs to hear the plans of the men and women who would lead it. The Democratic National Committee ends 2016 in trouble. The presidential candidate most party insiders supported lost to Donald Trump, cratering in the Midwest, despite winning the popular vote. The WikiLeaks revelations, while mainly amounting to gossip, further weakened faith in the institution. Popular party insider Donna Brazile, who became interim chair after the WikiLeaks scandal forced out Debbie Wasserman Schultz, was herself hurt by a later WikiLeaks suggestion that she provided a debate question to Hillary Clinton (which Brazile denies). Brazile only agreed to serve as interim chair, anyway, and so the DNC needs a new leader. Members will convene to elect a chair in February or March, though the process is obscure. The party is blessed with a roster of promising candidates: former Vermont governor and DNC chair Howard Dean, Minnesota Congressman Keith Ellison, South Carolina Democratic Party chair Jaime Harrison have formally declared their candidacies; NARAL Pro-Choice America chair Ilyse Hogue is interested, as is New Hampshire Democratic Party chair Ray Buckley, and Labor Secretary Tom Perez is said to be considering a run as well. Former Maryland governor and 2016 presidential candidate Martin O’Malley, who talked about it, has announced he won’t be a candidate, as has former Michigan governor Jennifer Granholm, thought to be a favorite if Clinton had been elected (it would have been her pick). Ellison, the co-chair of the Progressive Caucus and the first Muslim elected to Congress, has been endorsed by Senators Elizabeth Warren, Chuck Schumer, Bernie Sanders, and Harry Reid, creating the sense of a done deal. But this is too important a decision to be left to party insiders. As someone who likes and admires Ellison, has a gut sense he would do a good job, and would like to see the new leader come from the populist left wing of the party, I nonetheless have to say: Democratic voters need more exposure to the full roster of candidates, and more input. Technically, the DNC is in charge of planning the presidential nominating convention, supervising the creation of its platform, fund-raising and working with state parties. But there’s a sense that fund-raising came to play too important a role, and supporting the state parties too little. Though Ellison is the favorite, Dean could be a formidable foe, since as the architect of the “50-state strategy” he is remembered fondly in lots of places Democrats take for granted—either as reliably blue or impossibly red. Now, a 50-state strategy is more important than ever. The good news is that once-red states like Arizona and Georgia are on the verge of becoming swing states; the bad news is places like Ohio and Iowa, which had leaned Democratic in presidential years through several cycles, have turned to the GOP. But Dean isn’t the only one who could implement a 50-state push. 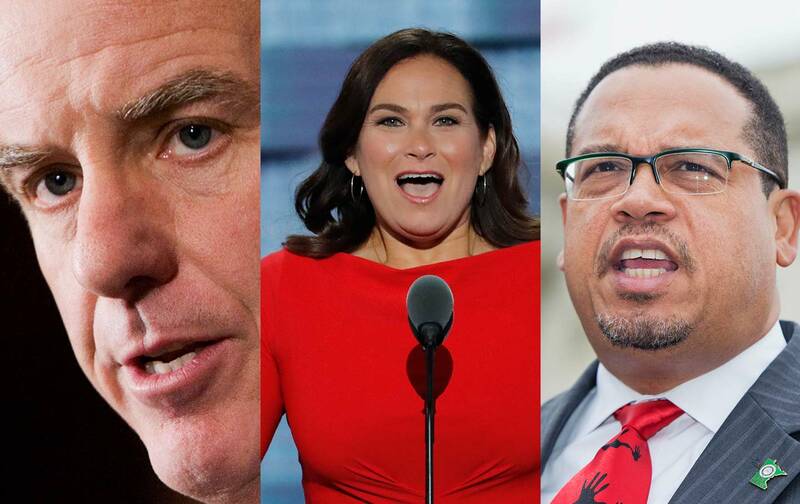 Another issue that has emerged is whether the DNC chair should be a full-time job, or can be performed by an elected official with a strong executive director. Again, the example of Dean, who did it full time, versus the case of Wasserman Schultz, who also had to worry about running for reelection every two years, is raising questions about Ellison’s candidacy, despite his other considerable assets. NARAL’s Ilyse Hogue, South Carolina’s Jaime Harrison, and New Hampshire’s Ray Buckley, like Dean, could all do the job full time. There’s nothing to say Ellison couldn’t handle it anyway—Wasserman Schultz had many other issues that led people to judge her harshly – but this is a question that should get a full airing. The truth is, the DNC, like the Democratic Party, needs a lot of reinvention. As a Hillary Clinton supporter who recognizes that she won the popular vote (her edge grows every day), I don’t mean to sound as though she, or the party, did everything wrong—the shift of a few thousand votes in a few states would have meant I’d be writing about her good or bad cabinet choices, instead of the DNC crisis. But the truth is, no candidate can or should be running a top-down campaign every four years. Clinton did more than many candidates to raise money for state parties, but many of the state parties had withered. Others say they weren’t listened to about strategy and staffing. One thing we know about the surprising surge of Trump voters, some of them former Obama supporters—whether we call them the white working class, non-college-educated whites, rural whites, formerly urban now post-urban whites (as in Youngstown, Ohio or Muncie, Indiana)—is that they feel disconnected from institutions that used to help them feel a part of something, that they’re pulling together, that they have common purpose, that somebody sees them. Unions used to play that role, and so did party organizations. Churches still do, but only on behalf of liberalism in the black community now, for the most part. Trump won, despite a nonexistent ground game, because there exists an infrastructure of outreach in these areas, from the National Rifle Association to the evangelical churches. Democrats have to think about confronting this sense of isolation, and whether and how the DNC can play a role in fighting it. Those are just a few questions facing the new DNC chair. A vibrant debate and contested election could also give Democrats something to pay attention to besides wound-licking and finger-pointing. Let’s hear the candidates tell us what’s wrong with the party and what’s right with it. Let’s hear how they plan to reenergize the state parties, to help Democrats overcome their disadvantage in statehouses nationwide. Some DNC leaders would likely welcome such a debate. “I literally don’t know who I’m going to support. I like them all, but I want to understand what they would do,” a prominent DNC member who supports an open debate told me anonymously. It’s time for leaders to make clear the timing and mechanism of the election—the last time there was an open fight for the seat, Dean won it at least partly by rounding up state party leaders in advance—and invite the public in, by scheduling at least one debate. I don’t know how it would work, who would sponsor it, or who the right partners would be. I just know the party would be better off if it opens all the doors and windows, and lets new ideas and people flow through.